Community residents can now receive important emergency and other time sensitive notifications instantly On-The-Go! What is the WISE Alerts Service? WISE stands for WIRELESS SMS E - Alert. Anyone who has an e-mail account or a mobile phone/pager that can receive alphanumeric text messages can use this service. as a terrorist attack, gas leaks or fires, Amber Alerts, road closures, water interruptions, and more. The service is available for residents of Iron Mountain and the surrounding community. Short messaging service is exactly what it sounds like—it is a text message sent or received to or from a mobile phone. The text messages are short, up to 160 characters, and if a phone is out of coverage, in use or turned off, the service holds the message until the phone comes back into the area. Using SMS is easy. 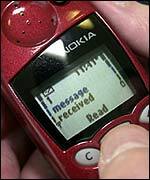 A person types a message on a phone (some phones have special dictionaries that make typing easier), specifies who is going to get the message, and sends it. Then the receiver sees the message displayed on their phone. Short messages can originate from other phones or the Internet, but they are all delivered via a short messaging center (SMSC). The SMS centers receive messages from a range of places, including phones within their networks, the Internet, and other mobile operators’ SMS centers, then send the messages to their customers.